If you stumble down a narrow alley located near to Oxford’s Bridge of Sighs rip-off (actually, it’s more of a Rialto Bridge rip-off but let’s not worry about such things) you will find the pub that is ‘possibly’ Oxford’s oldest. As you’d expect from a pub that is several hundred years old it is a bit of a ramshackle affair. And as you’d expect from a pub located in Oxford it is usually jammed full of students and tourists. If you are anywhere near 6 feet tall and don’t like crowds comprised of people with high IQs and/or large cameras you might want to avoid the place. The bar is split in two by a supporting wall. Greene King beers occupy one side and beer from other breweries, which are just as exciting as GK, occupy the other. I went for a pint of Old Rosie. Twelve real ales on tap and I opt for a cloudy flat cider! I sat outside and watched the people come and go (sadly, not talking of Michelangelo). Most of the folk with large cameras took a photo or twelve before departing without buying a drink. Most of the students went a sat in one of three outside areas and smoked designer cigarettes. I left straight after my last heroic gulp of fermented apple juice. There was no reason to hang around. The Turf Tavern is a bona fide tourist attraction. If you go to Paris and don’t see the Eifel Tower people will laugh at you. If you go to Oxford and don’t see where Bill Clinton didn’t inhale people will laugh at you. Let them laugh. The New Cross Inn stays open late. I’m sure that if you the secret special hello you can drink there 24 hours a day. It’s an interesting pub. It can’t be described as on old fashioned pub but it has none of the trappings of the modern world. Seating comes courtesy of beer barrels with planks of wood on top and the kind of bench you find it the picnic areas of your local park. There’s a pool table and it’s very much the hub. It’s the kind of pub where you half expect fights to break out over the pool table but I don’t believe that ever happens, which is nice. The New Inn is also a live music venue. 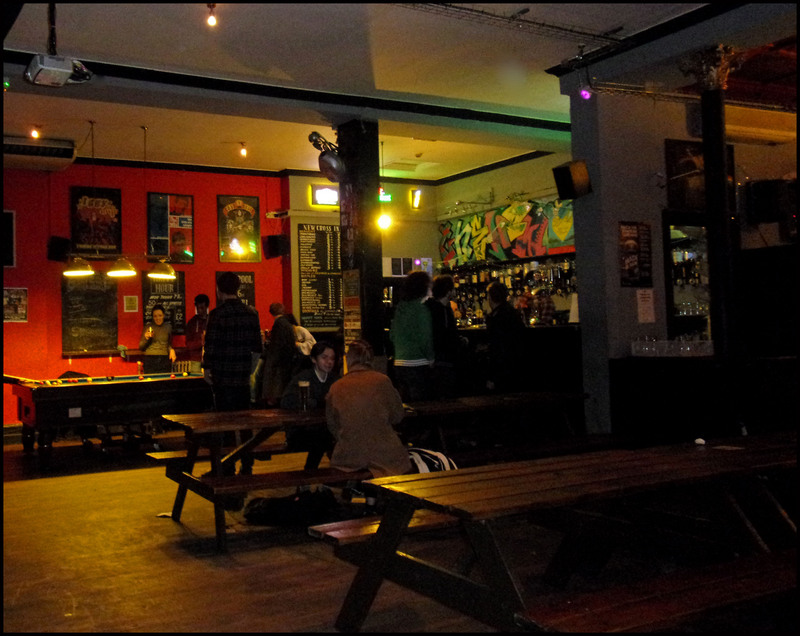 Old skool Punk and Ska legends are known to have graced the stage – the Selector played there on NYE 2013. Beer wise the place isn’t very exciting: mass market keg or Tribute, Proper Job, Dartmoor and Dommbar were what I was greeted with this visit. But you don’t go to the New Cross Inn for the beer. No. No. No! You go to the New Cross Inn for a pint of Old Rosie Cider. Yes. Yes. Yes!